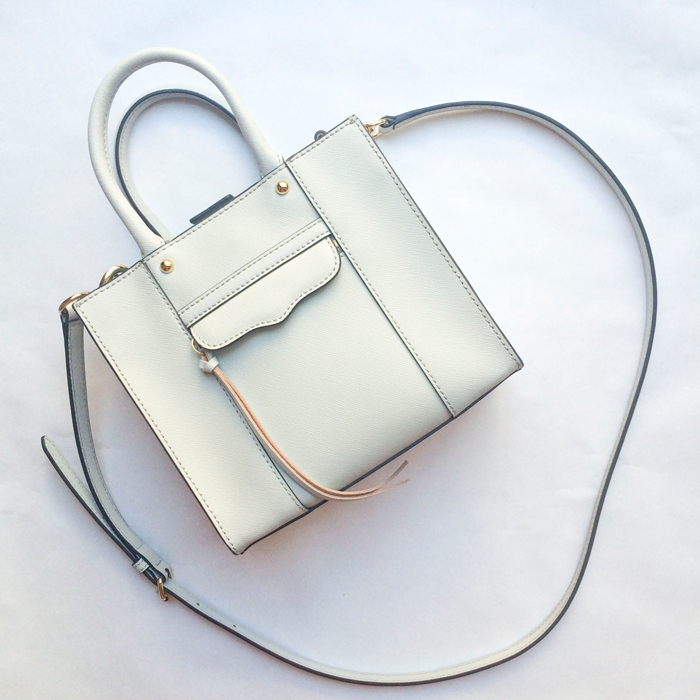 When I first saw everyone carrying the Rebecca Minkoff Mini MAB Tote I thought: "oh my gosh it's so cute and little!" Then I thought: "okay, that purse makes no sense it probably holds next to nothing." Well fast forward a couple of days after first seeing it (yes, days, I fell that hard) I had ordered this little nugget in the color Fog for Charleston. Did you guys catch how I styled it in yesterday's post? To convince y'all that it holds more than you expect I'm showing you what's in my bag! I was pleasantly surprised to see that I could fit what I needed for exploring Charleston and then more inside this Rebecca Minkoff purse! Everything is miniature-sized but I didn't want to have a lot of extra "junk" while traveling. I also didn't need a massive wallet with all of my gift cards, etc. I always carry my favorite sunglasses, gum, multiple lipsticks - my favorite is NARS "heat wave", business cards, bobby pins and hair clips, headphones, and my keys attached to a suede tassel key chain (similar ones on Etsy). The best addition was this little mini umbrella! You never know when you're going to get caught in the rain so I always have one on me (along with a koozie hehe). I also normally carry hand sanitizer and band-aids with me… you can never be too prepared! 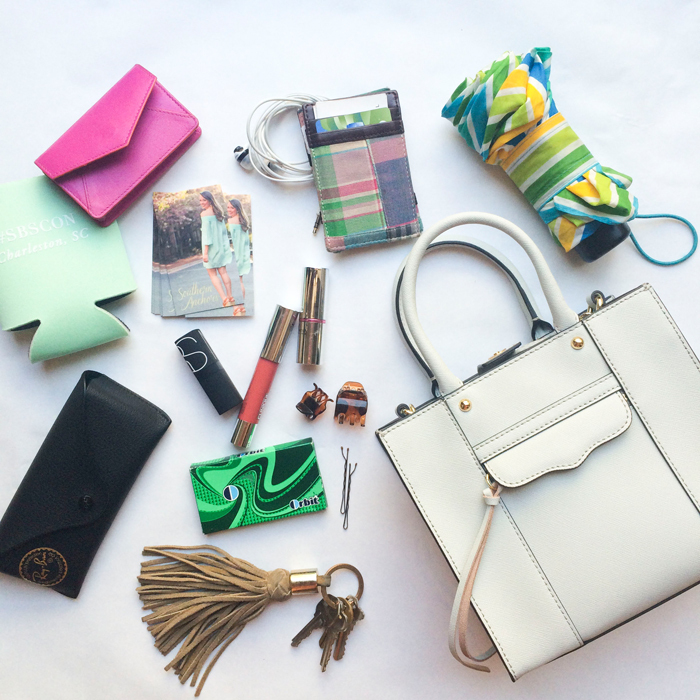 What do you have in your purse that you can't leave home without? PS. Don't forget to enter the $500 Lululemon giveaway!! Love this little bag – so glad to see that it really can hold all the essentials plus a little bit more. Such a helpful post!! Love that cute little bag! And I am shocked at how much it holds! Such a cute purse! Seems like it carries the perfect amount- I always tend to overload my tote bags!